Here is a excellent open access (FREE!) 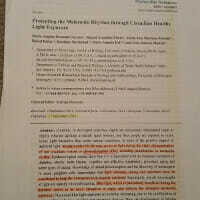 article that appears in the International Journal of Molecular Sciences. This article provides a comprehensive look at the problems with artificial lighting and circadian disruption. When I say comprehensive I mean 398 references! It gets heavy into biology but well worth digging into even if you are a layman such as myself. Currently, in developed countries, nights are excessively illuminated (light at night), whereas daytime is mainly spent indoors, and thus people are exposed to much lower light intensities than under natural conditions. In spite of the positive impact of artificial light, we pay a price for the easy access to light during the night: disorganization of our circadian system or chronodisruption (CD), including perturbations in melatonin rhythm. Epidemiological studies show that CD is associated with an increased incidence of diabetes, obesity, heart disease, cognitive and affective impairment, premature aging and some types of cancer. Knowledge of retinal photoreceptors and the discovery of melanopsin in some ganglion cells demonstrate that light intensity, timing and spectrum must be considered to keep the biological clock properly entrained. Importantly, not all wavelengths of light are equally chronodisrupting. Blue light, which is particularly beneficial during the daytime, seems to be more disruptive at night, and induces the strongest melatonin inhibition. Nocturnal blue light exposure is currently increasing, due to the proliferation of energy-efficient lighting (LEDs) and electronic devices. Thus, the development of lighting systems that preserve the melatonin rhythm could reduce the health risks induced by chronodisruption. This review addresses the state of the art regarding the crosstalk between light and the circadian system.